Friday night skywatches coming in Aug.
Pictured is Ohio Wesleyan University’s Perkins Observatory, located at 3199 Columbus Pike (U.S. Route 23), Delaware. In August, Perkins Observatory returns to its regularly scheduled Friday night public programs – and what a return it will be, says Don Stevens. 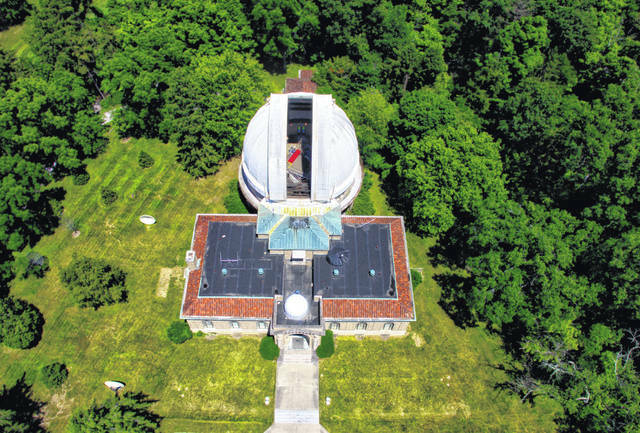 “We have four of the five naked-eye planets in the evening sky,” said Stevens, interim director of the Ohio Wesleyan University-owned observatory, 3199 Columbus Pike (U.S. Route 23), Delaware. Each Friday night program will include an astronomer’s talk followed by observing with telescopes, weather permitting, or a tour of the observatory if guests can’t observe. “Observing is unfortunately never a guarantee, particularly with the 32-inch telescope; however, we will do our best to give you life-changing views through the many telescopes, big and small, provided by volunteers from the Columbus Astronomical Society,” Stevens said. The observatory’s public skywatches will start promptly at 9 p.m. each Friday night in August. All tickets are $10. To reserve tickets or determine at-the-door availability, call 740-363-1257. Reservations are strongly recommended for these and all Perkins Observatory events, as many programs sell out.